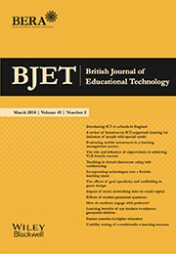 Since 2010, BERA has been proud to add the very influential British Journal of Educational Technology (BJET) to its publications portfolio. BJET provides readers with the widest possible coverage of developments in educational technology world-wide and is the primary source for academics and professionals in the expanding fields of education, training and information technology. For more information, please visit the publisher’s website. Members should click on Read this journal online to get free access. BJET is celebrating 50 years of publishing world-class research reports and reviews. Click here for more details of the special content we’re publishing to mark the occasion. Carina Girvan, Sara Hennessy, Manolis Mavrikis, Sara Price and Niall Winters took up the editorship of BJET on 1 July 2016, and their term will initially run until December 2019. This team brings a wealth and breadth of relevant experience and scholarly expertise to the role and BERA is delighted that BJET is in such good hands. We are confident that under their leadership, BJET will flourish and be a leader of contemporary developments in this international field for researchers and practitioners. The team will look to build on BJET’s strong reputation and increase its reach and impact. The journal will retain its commitment to internationalism, inclusiveness, innovation and capacity building.